June 2017 (Hong Kong) – Hong Kong’s MeReal Biometrics launched its latest V2 smart card today with a smaller, faster fingerprint sensor, at the opening of the world’s first casino designed solely for open-air gambling, in the South of France. Today, the patented smart card was in the spotlight at the opening of the new Pleinair Casino in the seaside town of La Ciotat in Marseille. It’s one of many exciting cutting edge innovations that this brand new casino boasts to win over a new clientele. The casino, situated on the water’s edge in the town’s marina, is one of 43 casinos and hotels in the Groupe Partouche portfolio. Pleinair Casino is the first of three properties to launch the MeReal Biometrics powered fingerprint and acoustic smart card this year. “This is a momentous day personally. Not only am I proud to be opening France’s and in fact the world’s first casino designed for open-air gambling, but it’s rewarding that my initial idea of a smart card that can identify all our players entering out casinos, hotels, and online games has finally come to fruition,” said Mr. Patrick Partouche, Chairman of the Supervisory Board of Groupe Partouche, also the Chairman of MeReal Biometrics. The MeReal Biometrics smart card will initially be used by employees to grant them access to private back-of-house and privileged areas, as well as provide record-keeping for time and attendance. The group hopes to add more applications – both access and payments – for employees and for its 1 million VIP players who currently carry a “Fairplayer” loyalty card. 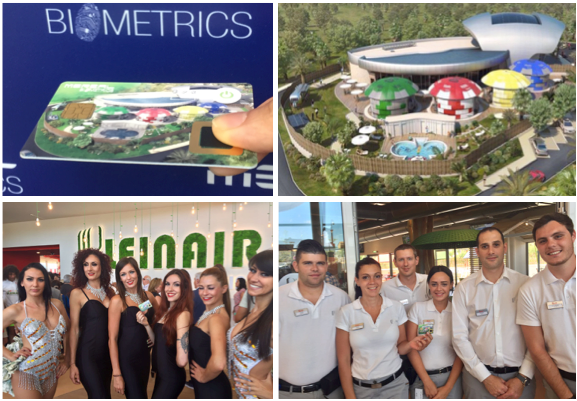 “We are excited to launch our V2 card at the opening of the Pleinair Casino. The hotel and hospitality industry is a world in which our card can add unlimited values. Employees, guests, and even suppliers can move around properties and within the brand’s footprint to gain access, make or receive payments, and redeem loyalty rewards without the hassle of typing logins, passwords, or showing identification documents but never compromising on security,” said Kate Davies, Head of Marketing for MeReal Biometrics. The MeReal Biometrics card, manufactured in France, also features the standard technology that everyday access and payment cards carry such as RFID (radio frequency identification), NFC (near field communication), and EMV (the EuroPay, MasterCard, Visa standard) chip technology. Combined with the MeReal Biometrics fingerprint sensor, acoustic one-time password and battery power, these cards have unlimited applications 24 hours a day. Use it in all contact modes, all contactless modes or on any device with a microphone, that includes the world’s 9 billion telephone lines (from smartphones to a fixed lines). Plus the cardholder’s fingerprint is stored only in the card not in a database. MeReal Biometrics Limited is a Hong Kong private company dedicated to changing lives with a revolutionary biometric card. In 2009 in France, Chairman Patrick Partouche invented a powered card that combines a fingerprint reader, acoustic/RFID dual channel authentication, plus energy-harvesting technology for recharging built-in batteries. Today the patented payments and access card can be used anytime, anywhere, any place. The company moved to Hong Kong in 2015 to set-up its global headquarters and to launch the technology to the world. For more information please contact Kate Davies, Head of Marketing, +(852) 9886 0196 or kdavies@merealbiometrics.com.